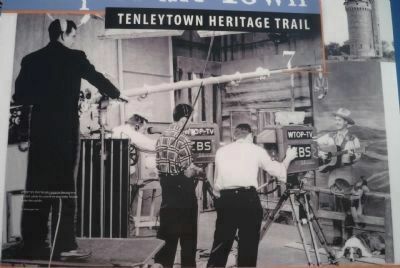 “Tenley Tower,” behind you, dates from the mid-1940s. Western Union Telegraph Co. built it as part of an experimental system using microwaves to transmit telegrams in the mid-Atlantic region. This new technology helped erase telegraph wires and poles from the landscape. 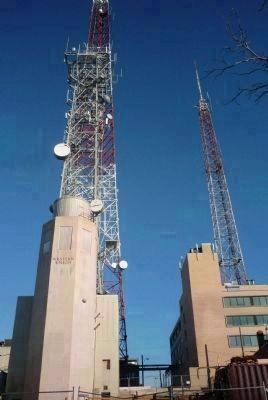 In addition, the tower was designed to relay recently invented television signals, which gave Western Union and its partner RCA a decided head start in the television revolution of the 1950s. During the Cold War era, the 90-foot tower also handled national security communications. In 1996 it became a cellular telephone transmitter. 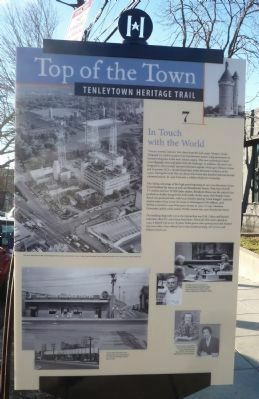 close-up of photographs, below text on front. 1993 American University’s public radio station WAMU moved into 4000 Brandywine Street. The building diagonally across the intersection was N.M. Cohen and Samuel Lehrman’s third DC-area Giant Food Store. 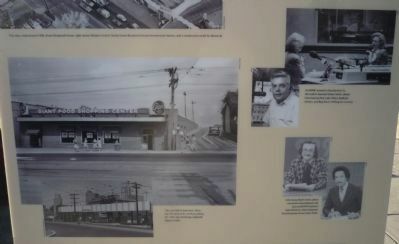 When the first Giant opened in 1939, it helped end an era. In place of the grocer who quoted prices and handed you your order, Giant offered up-to-date marked pricing, self-service, and efficient check-out. Location. 38° 56.988′ N, 77° 4.838′ W. Marker is in American University Park, District of Columbia, in Washington. Marker is at the intersection of Wisconsin Avenue Northwest and Brandywine Street Northwest, on the right when traveling south on Wisconsin Avenue Northwest. Touch for map. Marker is in this post office area: Washington DC 20016, United States of America. Touch for directions. Other nearby markers. At least 8 other markers are within walking distance of this marker. Luis Alves De Lima E Silva (about 400 feet away, measured in a direct line); Set in Stone (about 400 feet away); Reno City (about 600 feet away); Beer, Popcorn, and Penny Candy (about 600 feet away); A Spirit of Community (approx. View toward Tenley Tower and Broadcast House Building. 0.2 miles away); Reservoir/Reno City (approx. 0.2 miles away); The Civil War Defenses of Washington (approx. 0.2 miles away); Fort Reno (approx. 0.2 miles away). Touch for a list and map of all markers in American University Park. "WTOP TV’s Pick Temple sings to the cameras in 1954 while his canine co-star, Lady relaxes under the saddle" [Washington Post]. 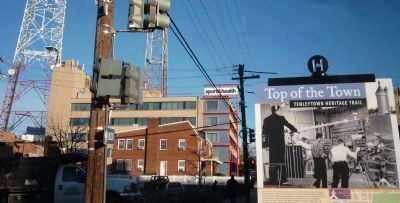 Viewed from Wisconsin Ave. near the "In Touch with the World" marker. More. Search the internet for In Touch with the World. Credits. This page was last revised on March 17, 2019. This page originally submitted on January 30, 2011, by Richard E. Miller of Oxon Hill, Maryland. This page has been viewed 864 times since then and 16 times this year. Last updated on March 8, 2019, by Devry Becker Jones of Washington, District of Columbia. Photos: 1, 2, 3, 4, 5. submitted on January 30, 2011, by Richard E. Miller of Oxon Hill, Maryland. • Devry Becker Jones was the editor who published this page.